Sunshine and great weather have brought with it the urge to hit the track for a few laps. Wanting to make sure a certain piece of classic rock music for my iPod was downloaded; I hit the search button on the ole computer. Once again my search proved again how isolated my world is. Not only were there links to safe and legal websites for music downloads, but there were also links to sites that claimed to have free songs, and movies. As our IT staff reminded me if it’s too good to be true it probably is. Deeper research revealed most of the movies and music on some of these sites are probably pirated. Pirated, what is that? I know it happened to me too; the image of someone wearing an eye patch and shouting Argh came to mind. 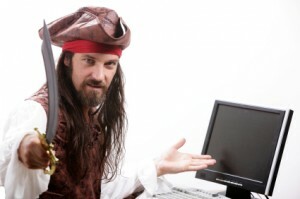 Unfortunately, cyber pirates look like me and you, and a lot like our kiddos. To say that a file is pirated is a nice way of saying that it was copied or downloaded without permission from the author. According to the United States Copyright Office the definition of Copyright is a form of protection provided by the laws of the United States (title 17, U.S. Code) to the authors of “original works of authorship,” including literary, dramatic, musical, artistic, and certain other intellectual works. This protection is available to both published and unpublished works. Most teens know how to download music, games and movies from sites we’ve never heard of. Sites like Limewire, Bit Torrent and Ares who use peer-to-peer (P2P) file sharing. This type of file sharing is when two computers talk directly to each other without the use of a server. Usually most teens and adults do not realize that these sites are often monitored by associations like the Motion Picture Association of America (MPAA) and the Recording Industry Association of America (RIAA). Periodic monitoring by movie studios and recording companies can result in you or your internet service provider receiving a letter notifying them of your copyright infringement. Copyright violations on university campuses have gotten so out of hand that many universities have policies and guidelines in place. Citations for Infringement violations can result in one or all of the following: having your internet service disabled, being required to complete a copyright education course, and having you computer examined by university IT professionals before their internet service is restored. The RIAA and the MPAA have some very informative public awareness campaign materials and guides for teens and parents that explain how copyright violations affect all of us. These materials also give good advice on how to download and share those files in a safe and legal way. Below are a few links to sites where you can purchase and download legal copies of your favorite tunes. In compliance with the Copyright Act Title 17 US Code Section 106, Brazos Internet’s policy is to suspend internet service of the infringing customer for 24 hours when written notification is received. To help you learn more about Copyright and Copyright Infringement we have provided a few links that offer really good information and will help you to identify pirated material.